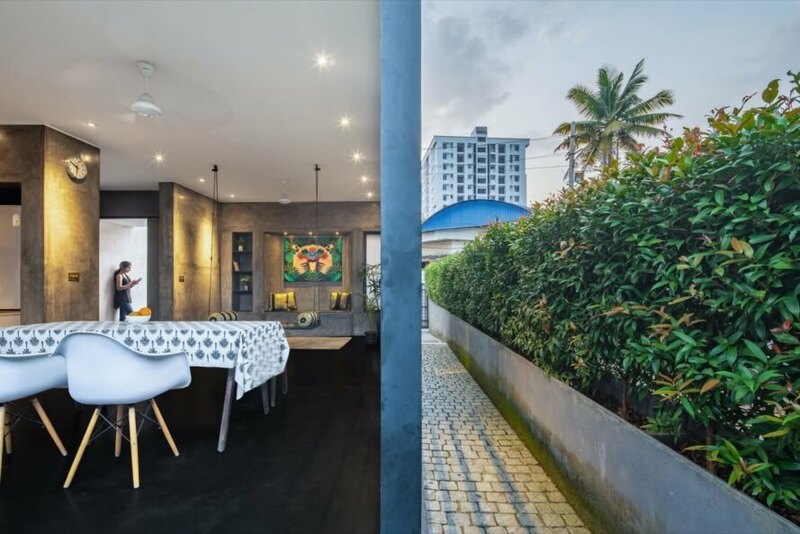 In the South Indian city of Kochi, local architectural practice Meister Varma Architects recently completed Maison Kochi, a contemporary home for a family of four that mitigates the region’s intense tropical heat with energy-efficient and cost-effective techniques. 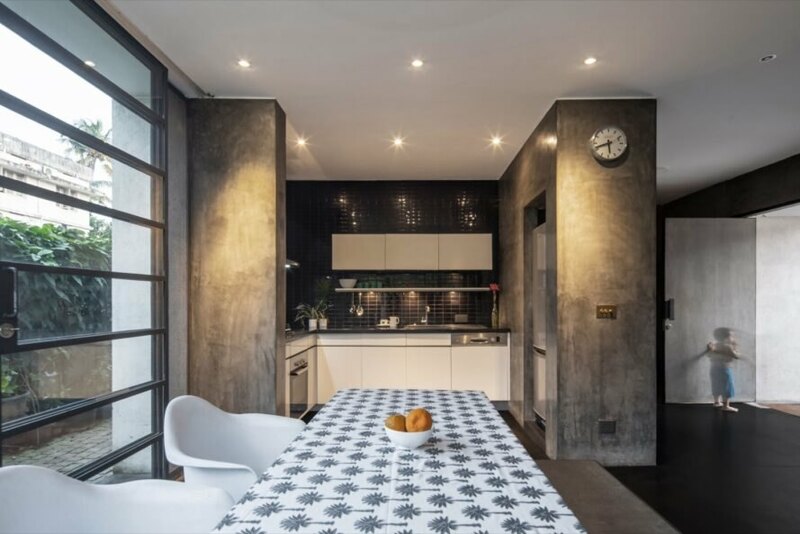 Inspired by the concept of chiaroscuro, a Renaissance artistic technique named after the strong contrasts between light and dark, Maison Kochi features a solid white exterior and a dark interior finished in polished concrete to create a cool indoor environment. The interior layout is also arranged to buffer the heat, while the roof is equipped with solar panels and a rainwater collection system. Slotted on a tight, 1,830-square-foot lot, Maison Kochi was commissioned for a family of four who also sought a studio and office space in the home. As a result, the west-facing building is split into two volumes — the volume on the south side is slightly taller to provide shade on the second volume throughout the day — for a clear division of space between the work areas and the primary living spaces. An open-plan layout and large windows allow for cross ventilation, while a vent in the roof access hatch lets hot air escape for natural cooling. On the ground floor, the work areas (a studio, tool shed and flex meeting room that can be used as a guest bedroom) are located on the south side of the house, while an open-plan living and dining room are located opposite; the two volumes are joined by the entry foyer and a compact kitchen. The master bedroom with a terrace, a children’s bedroom, a TV room and a study are upstairs. 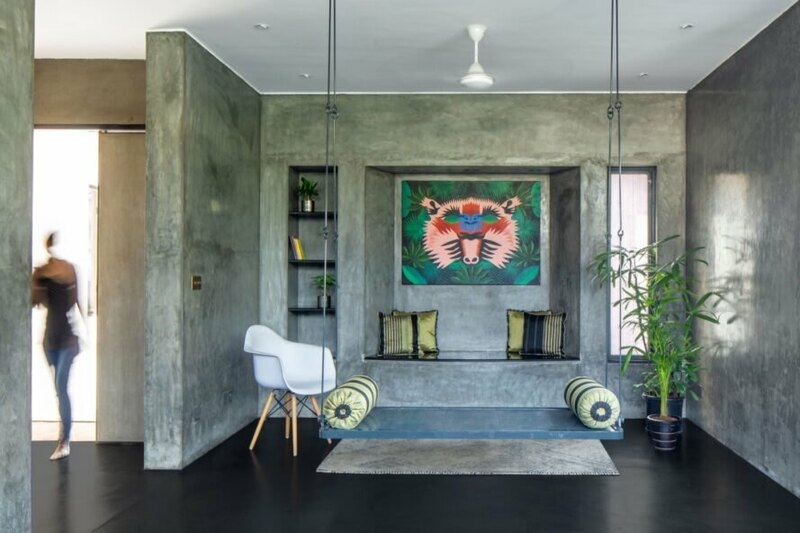 To soften the polished concrete walls and black oxide floors, the interior is dressed with Kerala sari-inspired fabrics and multicolored baskets that mimic traditional urban crafts. Almost all of the interior furnishings are custom-made. 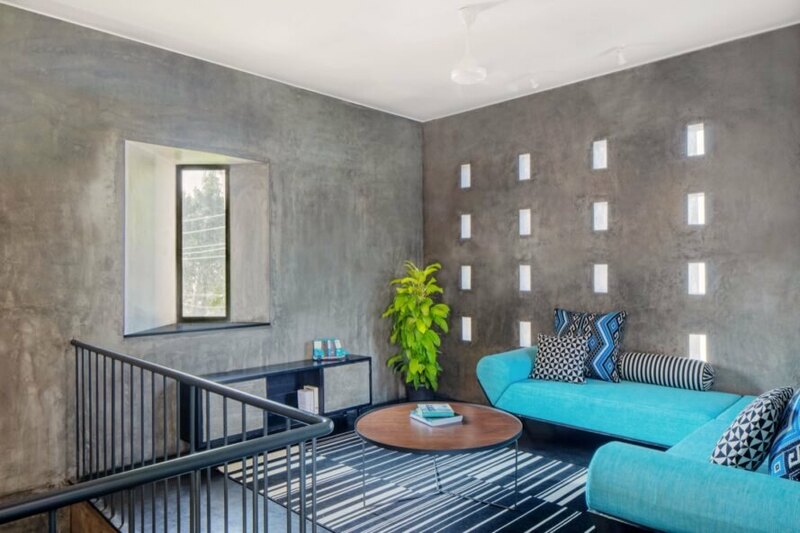 Meister Varma Architects designed this concrete home for a family of four in Kochi, India. The house relies on natural ventilation to remain comfortable year-round. 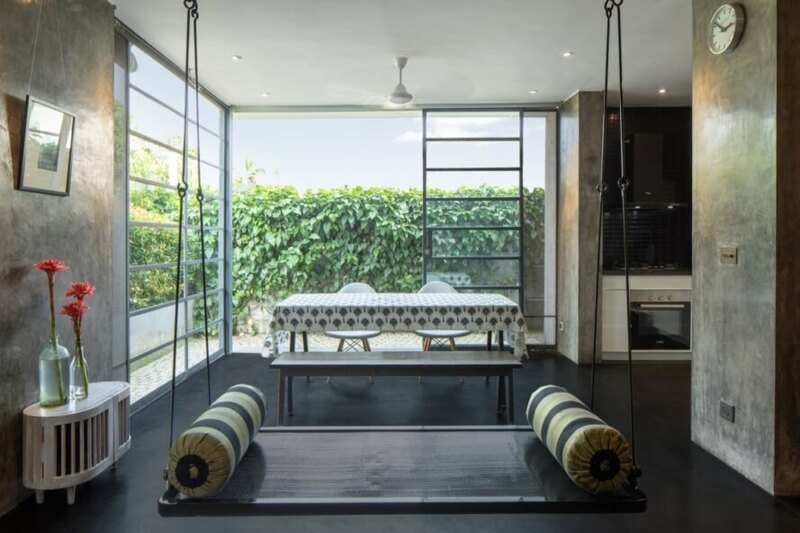 Polished concrete also helps mitigate heat. Unique furnishings inject plenty of personality into the space. Darker materials are offset by vibrant colors and patterns. Plenty of attractive storage features can be found throughout the home. 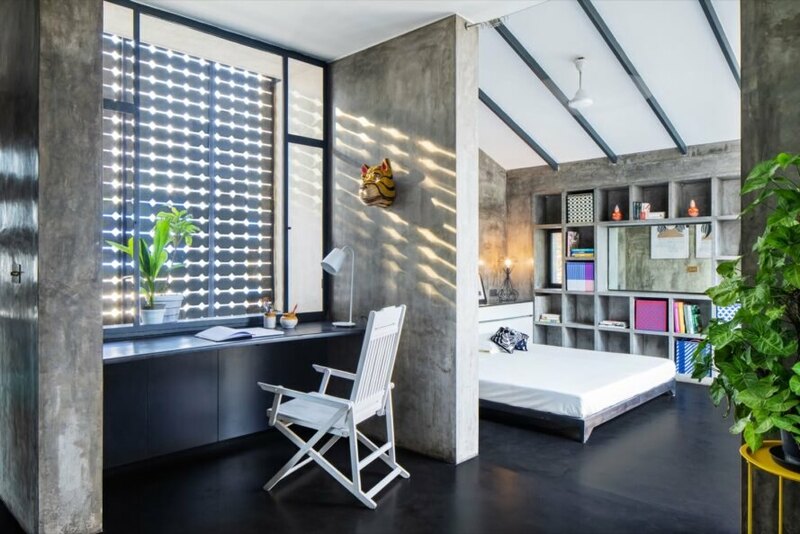 The home is divided into living and working spaces. Work areas are found on the southern side of the house, while living spaces are on the opposite side. The home opens to the outdoors to embrace the tropical temperatures. The roof is home to a rainwater collection system and solar panels.